It feels like forever since we've heard news of the upcoming season of American Horror Story, but now it seems that the wait is officially over. 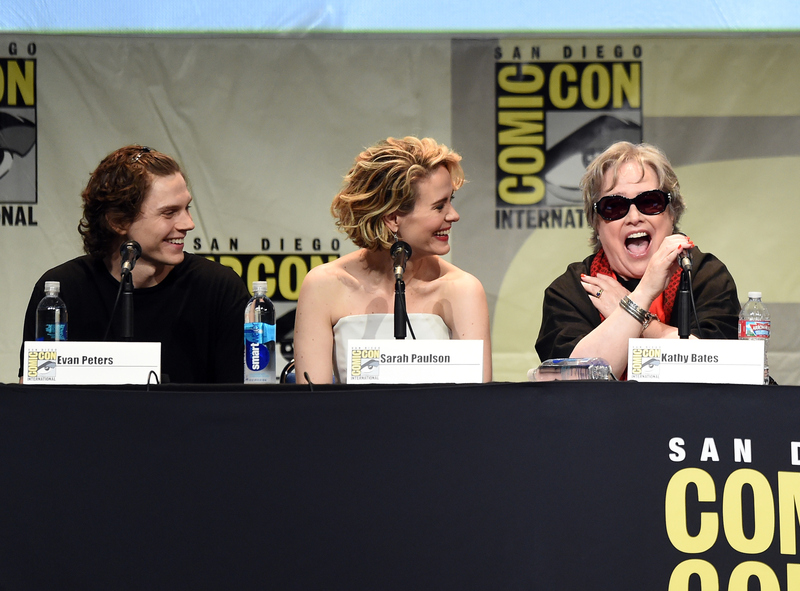 Creator Ryan Murphy spilled some major secrets about the upcoming American Horror Story: Hotel at the show's panel at Comic-Con in San Diego, and if you've been watching American Horror Story since day one you're going to love this news. According to Murphy, we're going to be seeing plenty of familiar faces on the upcoming season, and he doesn't just mean recurring actors like Evan Peters, Kathy Bates and Sarah Paulson. According to the showrunner, we're going to be seeing plenty of familiar characters as well, which will further expand the AHS universe that Murphy stated connected all the previous seasons just last year. Things are connected... This season, you’ll see more and more and more of that. Characters from previous seasons will come check into the hotel. The hotel is the perfect scenario to bring in characters we said goodbye to in previous seasons. The very nature of a hotel allows characters to breeze in and out of the series: when their stay comes to a close, so does their arc. It's a brilliant move, and it will further prove all of the little ways that the five seasons are connected, though it does beg to question whether the show will be told in a certain time period, or utilize flashbacks in order to showcase characters from several different seasons. The Harmons are the American Horror Story originals — the very first people to be our eyes into Murphy's creepy world. We haven't seen too many connections made from Murder House (or, at least, none that we can recognize) so it would be cool to see these characters once again, perhaps in a scene before they move into the house that would become their tomb. We saw Pepper in both Asylum and Freak Show, so it's only fitting that another resident of Briarcliff makes an appearance. How would that match up with Evan Peters' new role as "Mr. March?" Perhaps he has a doppelganger out there — weirder things have happened on American Horror Story. I adored the badass and long-suffering Lana, and of all of the people most likely to check into a hotel, it's her. Lana becomes a world-renowned reporter after leaving Briarcliff, and it wouldn't shock me if she checked into a certain haunted hotel on a book tour. She is attracted to the darkness. The ever-fabulous fashionista may have been burned at the stake, but I'm sure she treated herself to a weekend getaway or two before she went. Think she only carries Balenciaga suitcases when she travels? I miss the witch with a capitol B's crass sarcasm — I wouldn't mind her creeping up to spew some venom in the new season. Emma Roberts did hint at Comic-Con that just because she was starring in Murphy's new show Scream Queens didn't mean that she couldn't return to AHS as a guest star... which means that we might be seeing some more of Madison in our future. Freak Show's Elsa Mars lives for the glamour, and what's more glamorous than a staying at a luxurious hotel? Jessica Lange may not have wanted to sign on as a season regular, but I hope and pray that she would give the new season at least one episode — it doesn't quite feel like AHS without her. Check out the new promo for American Horror Story: Hotel below.